Set a decade after the events of the series’ first three films, VICTOR CROWLEY reunites Hatchet mainstays Kane Hodder (also known as the infamous Jason Voorhees from the Friday the 13th franchise) and Parry Shen for an all-new, horrifying journey into the haunted, blood-drenched bayou. VICTOR CROWLEY’s cast also features Laura Ortiz (The Hills Have Eyes), Dave Sheridan (Scary Movie), Felissa Rose (Sleepaway Camp) and Brian Quinn (Impractical Jokers). Writer/director Adam Green (Frozen) returns to the director’s chair. We pick up the Hatchet story 10 years after the previous installment and for once series regular Parry Shen reprises his role (He played three different characters in the series) as the lone survivor of the Victor Crowley massacre; an incident which has left him with a degree of survivors guilt but not enough to stop him making a quick buck over the years. This is how this story starts as his agent (Felissa Rose) makes him an offer he can’t refuse to return to the swamp once more. Felissa’s performance was one of our favourites in the film as her straight-forward but nutty broad routine had us in stitches. The new cast members also provide a lot of laughs as well as the opportunity for some gory and franchise-worthy kills & scares (this film is definitely not for the faint-hearted!). Impractical Jokers fans will no doubt get a kick out of Brian Quinn’s appearance in the film and he also gets a lot of laughs. Adam Green makes a triumphant return to his franchise offering plenty of nods to the series and his other films that die-hard fans will no doubt enjoy. 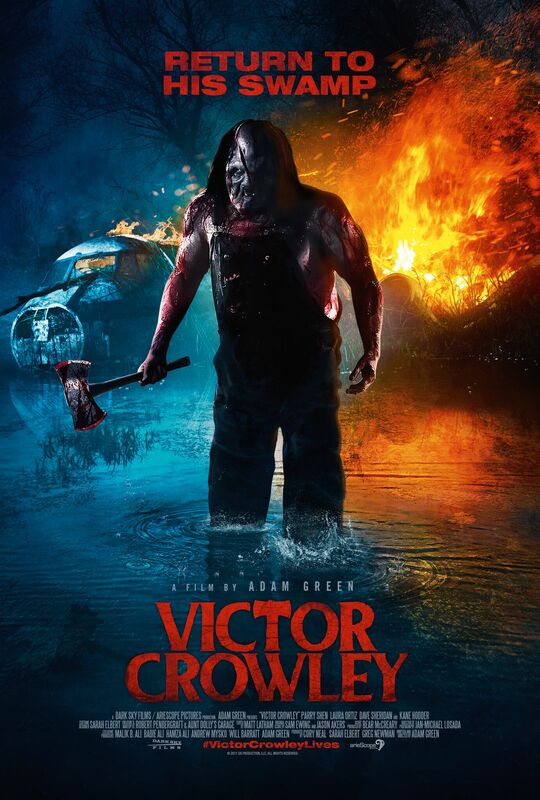 The film also begins with a visually pleasing retelling of the Victor Crowley legend which is a nice addition for those who have not seen the previous instalments. And let us not forget Kane Hodder who gets to take his performance as Victor Crowley (a character he helped to bring to life) up to whole new level in this film. Fans will also want to watch through the credits as there is a little extra scene that makes the ending all that more satisfying and sets up the potential future of the franchise!!!! 4/5 – A real treat for Hatchet fans but also an enjoyable (if gory!) horror film in it’s own right.